Mysterious Mayan ruins, thick jungle, clear Caribbean waters and fascinating culture. All that draws visitors to this beautiful Central American country. Enjoy unparalleled water sports or jungle exploration before coming home to sumptuous accommodations at the Belize luxury resorts. Every one of these four- and five-star Belize luxury resorts are an artful mix of comfort, like pampering spa treatments, delicious cuisine, and exemplary service. Together with the stunning surroundings, they will provide an unforgettable vacation adventure. Arrival by boat is the only option for this secluded and unique island resort. All accommodations are sumptuous villas. The all have traditional palapa roofs, many with ocean views and locations at the edge of a private beach. The restaurant provides Belizian fusion cuisine utilizing fresh seafood and local ingredients. Guests can fill their days with massages, sea kayaking, excursions to Mayan ruins, snorkeling or other activities. On TripAdvisor, El Secreto has overall good reviews from other tourists. So make sure to check them out to see if their expectations were met. Rooms and suites in this exclusive retreat come with all modern conveniences amid traditional folk art, Caribbean furniture, and soothing colors. Located on a sandy peninsula, the resort balances its serene seaside location with convenient access to the charming village of Placencia. Go deep sea fishing and return with your catch to let the chef prepare it as a special meal. Borrow the resort’s kayaks and explore the lagoon. Horseback riding and zip line adventures are also available for booking. Overall, guests’ satisfaction was met, so make sure to read their impressions to see what made them glad to have stayed here. These sleek and modern jungle suites and villas feature sumptuous linens and private gardens. The on-site restaurant is supplied from the resort’s two-acre vegetable plantation. Traditional Latin cuisine includes ceviche, tamales and local seafood garnished with plantains, mangoes, coconut milk, and pineapple. Enjoy excursions to Mayan ruins, trek through a nature reserve or kayak through water-filled caverns. At this resort, guests had a great stay. Go through their written accounts to see what makes this resort a 5-star one. Rustic glamor characterizes this jungle lodge, unique among Belize luxury resorts for its location amid hundreds of thousands of acres of nature reserve land. The on-site restaurant supplements its ingredients from the working farm that is part of the resort. The area is famous for bird-watching. Also, guests can hike the resort’s trails in search of wildlife, medicinal plants or Mayan ruins. A 4-star rated resort, this one has great reviews on TripAdvisor, so make sure to go through them for tips and for information about what they found there. Built in British colonial style, this luxurious plantation house located on an island near Mexico’s Yucatan Peninsula is convenient to the town of San Pedro, but still seems remote and private. Beautiful furnishings and lush jungle compliment the tastefully decorated rooms and suites. Fresh seafood, fruits, and exotic ingredients highlight the culinary genius of the on-site restaurant. While there’s plenty of adventure to be had, the tranquil setting offers the perfect chance to relax. A romantic getaway or just a place where to sit back and relax. But don’t take it from us, read these guests’ reviews to convince yourself. With its proximity to the Belize Barrier Reef, the clear Caribbean Sea near Placencia is the perfect spot for diving and snorkeling. The resort features sophisticated elegance mixed with rustic Belizian architecture. Rooms are artfully decorated and offer every comfort. The on-site restaurant features Italian and Belizian fusion cuisine. Not to mention the spa treatments. These take their inspiration from traditional Thai techniques. Guests have written positive reviews about Turtle Inn, which you should read for a better impression. One of the first eco-friendly Belize luxury resorts, the Cotton Tree Lodge, appealing palapa-roofed compound features access to a range of outdoor adventures. All the while, it offers a quaint jungle retreat with all the conveniences. The lodge’s restaurant serves organic cuisine complete with food from the resort’s garden. It also serves favorite cocktails using exotic tropical fruits. Kayaking, hiking, horseback riding and swimming in caves are just some of the local activities. Go through these guests’ opinions for an informed, in-depth opinion about this lodge. One of the most iconic Belize luxury resorts, Roberts Grove sits on a stretch of private sandy beach with the sparkling Caribbean Sea framed by lush jungle. Many of the rooms have sea views and feature private balconies. There are three gourmet restaurants featuring Belizian, Mexican and international cuisine. Some quick hints: river tours, exploration of Mayan ruins, jaguar sightings and zip line excursions. And these are just some of the exciting activities. Go through these testimonies that guests wrote on TripAdvisor for more information about what this hotel has to offer. Private docks and luxury villas are a feature of this exclusive island resort. Only seven villas on the entire island ensure guests the ultimate in private getaways. Luxuriate in the peace and quiet or enjoy snorkeling or fishing in the clear waters. Personalized menus are created by gourmet chefs for each guest before they even arrive. Outdoor showers and private plunge pools are just some of the perks of each charming villa. A true gem of luxury, guests say that they’ve had the experience of a lifetime staying at this hotel. Read for yourself to see. Seeking to mix a luxury resort stay with eco-friendly sustainability, the Lodge at Chaa Creek offers harmonious accommodations in both traditional and modern style. These accommodations adhere to environmentally sound practices. It also has a beautiful infinity pool that’s surrounded by thick jungle. It provides a spot to soak up the Belizian sunshine. And the butterfly exhibit, nature reserve hiking trails, organic farm and equestrian center all provide pleasurable distractions from lounging poolside. Guests felt great staying at the Lodge at Chaa Creek. Read their reviews to see why. For those looking for a quiet haven where they can relax and enjoy a wellness retreat, these Belize luxury resorts offer the perfect answer. It’s also the ideal spot for a range of adventurous activities, like cenote diving, jungle horseback riding, cave explorations and jaguar sightings. No matter what kind of vacation you crave, you’ll find it in Belize. 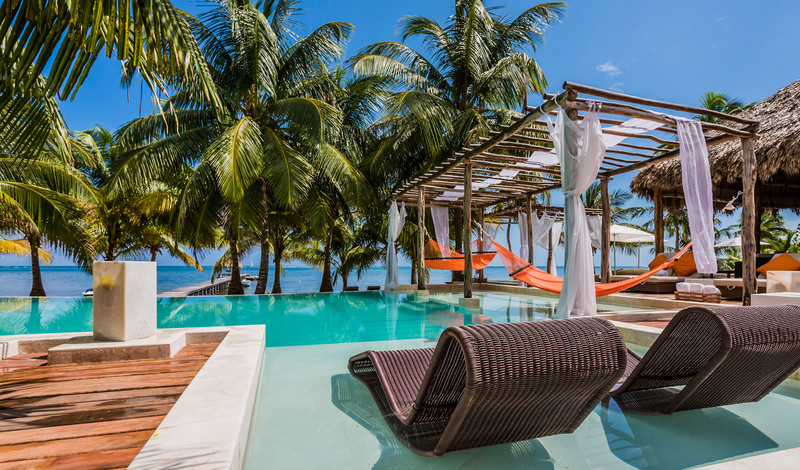 Have you ever enjoyed a stay at one of these Belize luxury resorts? Tell us all about your adventures in the comments below. Don’t forget to subscribe to our newsletter for more luxury hotels for your desired vacation trips. Trust us; you won’t regret.